He trained under George Chalmers and William MacTaggart. His mature style was influenced by the move in painting toward rural Naturalism (Sir George Clausen) and the French Realists (Jules Bastien-Lepage) and also owes a little to Impressionism. 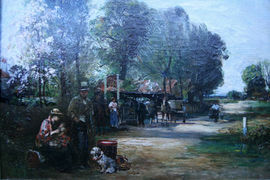 He first found success with natural outdoor scenes of the Surrey countryside, and was notable at the time for painting his scenes entirely on location, with the use of hired local people posing in the scene. His sisters, Lizzie Reid and Flora MacDonald Reid (1879-c.1929), were also exhibiting artists. Reid was the great-uncle of Sir Norman Reid, Director of the Tate Gallery.